When you talk of an artist what emerges in mind is the image of a solitary genius, a hard working soul almost lost in his creative world to create a piece of marvel. However, The word Art is derived from a root which means to “join” or “fit together”—that is, to make or craft. Though traditionally we interchange the word artist with artisans,but is a flawed approach. It is this subtle difference which the creative entrepreneur of the smart city Bhubaneswar has brought to light. Denying the claim to be an acclaimed artisan himself, Likan Patra, the founder of ArtyaCraft, is definitely a true artist. He is art enthusiast who understands the pain of the talented souls who strive hard to make their living. He thus came up with a platform for the artists, artisans and art Lovers where they can not only exhibit their talent but also monetize it via various sources like exhibitions, events and the most powerful medium that is the internet. In 2015, an engineer and tech blogger,Likan laid the foundation of his start-up named ARTyaCRAFT store in the heart of the city Sahid Nagar, opposite Bhawani Mall to assume the new role of an art entrepreneur. The elite art studio offers authentic artifacts and attractive crafts for sale. 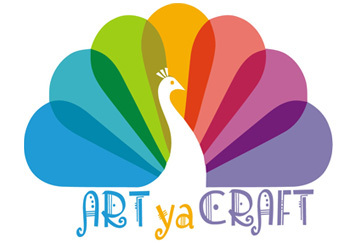 It has a rich collection of customized corporate gifts, mementos,home décor products for which online ordering facility is also available @ artyacraft.com. They indulge in Paper Quilling Craft, Recycle Craft, Selfie Points, Realism painting, Street Art, Graffiti Designing, Theme based designing etc. Workshops at Schools & Colleges to propagate new Art & Craft forms is also taken up by this venture as Art to instill skills and confidence in the young buds.With a talented team of 10 artists,they have conducted around 100 workshops. Paper Quilling Craft has found huge popularity with already 1500 students and more in the making. Sujit Bose handles the Paper & Recycle Craft division while the Art Works division is managed by Rajesh Moharana. 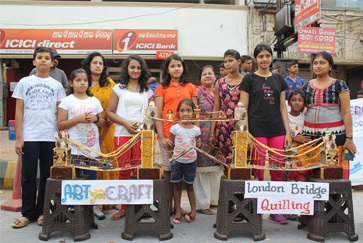 Stealing away the limelight in the Rahagiri Bhubaneswar has become a norm with ArtYaCraft. 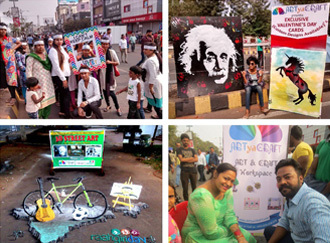 They have created more than 20 life size paintings at Rahagiri, based on various themes, at this non-motorised traffic promoting event. Complementary live paper quilling workshop is one of the most sought after corners in the colourful streets during Rahagiri. Hailing from the pious city of Puri, blessed with a creative heart, Likan is packed with innovative ideas. Since his childhood, he had a knack of giving beautiful form to the old discarded stuff. He may not directly create artifacts or Craft Works but is surely driven by a force to carve a niche for the skilled artist who deserve not only appreciation but also a means of livelihood and superior lifestyle. “Art enables us to find ourselves and lose ourselves at the same time.”So if you are in a mood to indulge in a maze game for an amazing experience, all you need to do is walk into the ArtYaCraft store.